Among the great fears of living in today’s world is the probability that we may someday end up in a hospital oncology ward fighting a losing and painful battle against cancer. We all know someone who has gone through the horrors of living with the side effects of the harsh chemicals and chemotherapy used in an effort to contain the virulent invading carcinoma from ravaging the entire body. Millions of dollars have been spent in developing costly oncology wards where doctors, who have specialized in cancer research have no problem thrusting newly diagnosed cancer patients into these endless cycles of long-term treatment against a ravaging cellular invasion that ultimately ends in an untimely death. In the meantime, patients and their families are mortgaging their homes, insurance companies are paying out billions and cancer clinics and pharmaceutical companies are raking in the dough. Everybody is getting rich on cancer. There is a strange sense that nobody wants this free ride to great wealth to end. When some researcher comes up with a working cancer cure in their little hometown lab he or she is usually written off as a quack and not taken seriously. We hear about these off-beat cancer treatment centers operating in Mexico or other parts of the world where the doctors don’t have to cross swords with the American Medical Association. But the terror of the cancer fight may soon be a thing of the past . . . much like the old practice of using leaches to heal infected wounds. A handful of doctors has uncovered a treatment for cancer that is so simple most people may be able to deal with it in their own home. It involves consuming a little baking soda in a home-made drink mixed with honey or fruit juice daily. That’s it. Baking soda, or sodium bicarbonate taken orally, increases the alkaline levels in the body, thus making it impossible for cancer cells to grow. In fact, continued treatment with baking soda may even inhibit metastasis and eventually eliminate the cancers altogether. That is because cancer feeds on stored acidic cells. And we make our bodies acidic by eating too much sugar and starch. When the body can no longer effectively neutralize and eliminate the acids, it relocates them in body tissue cells and this is when the cells begin to go crazy and turn cancerous. Curing cancer may be that simple. It will involve gulping down a little baking soda mixed with honey in a liquid base every day, and changing our regular diet to balance our pH to a healthy level between 7.35 and 7.45. Staying in that range makes us resistant to disease like cancer, diabetes, and even the common cold. 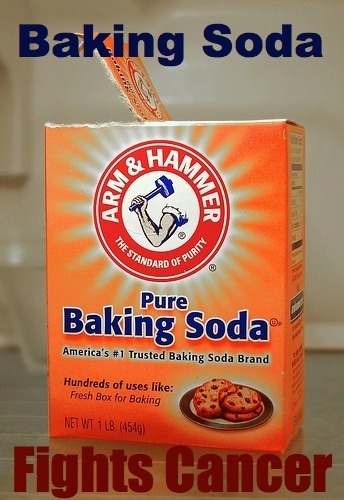 We don’t want to go overboard on this baking soda thing, however. If the body becomes too alkaline from too much bicarbonate in the blood, the result is metabolic alkalosis. While alkalosis isn’t fatal, it can make you pretty sick. The results are confusion, light headedness, muscle twitching and spasms, nausea, and tingling in the face, hands and feet. Since people don’t keep devices in the home that determines normal pH levels, the old adage: "talk to the family doctor" applies. But the good news here is that cancer cells need an acidic environment to grow and spread through your body. If you can change that environment it appears possible that we not only can stop the cancer’s growth, but eliminate it altogether. The problems with chemotherapy is that it makes the patient ill, it involves continued treatment for an extended amount of time, it is very costly, and the treatment is toxic to every cell in the body. It is used for most cancer patients because hospitals have invested heavily in the equipment and doctors and pharmaceutical companies make a lot of money from it. The effectiveness of chemotherapy is poor. It has actually been shown to boost cancer growth and long-term mortality rates. My brother went through months of chemotherapy when he developed cancer. He left the hospital so ill he couldn’t walk without help and lost his ability to speak. He died of a heart attack a few days after arriving home. I have had friends and acquaintances that have gone through the same horrors in their battles against cancer. They are all dead today. A small number of cancer experts now think that by buffering the tumor micro-environment with an alkalizing compound, the pH of tumors can be increased enough to starve them and consequently top their growth. I wish I had known this two years ago when my wife was dying of cancer. She was smart enough to say no to the chemotherapy option. Her cancer of the pancreas was aggressive and she died peacefully at home within a week after being diagnosed.